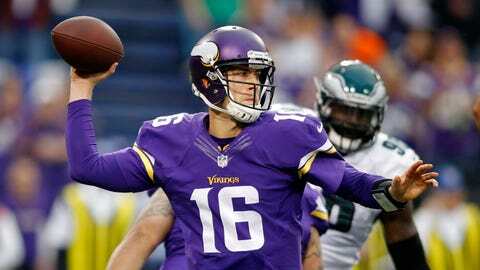 Matt Cassel completed 26 of 35 passes for 382 yards with two touchdowns and an interception in the Vikings' win over the Eagles. The statement is fact. There are no questions this week; no quarterback controversy, no spin on the wheel. Cassel is Minnesota’s starter after a season full of weekly questions and four changes in which all three quarterbacks have started a game. Cassel has solidified himself — and maybe ended Christian Ponder’s tenure with the Vikings — with his performance last week, if not the past three weeks. In beating Philadelphia on Sunday, Cassel threw for 382 yards, the most by a Vikings quarterback since Brett Favre in 2010. "There were some plays out there that we need to take advantage of because of the way we run the ball," coach Leslie Frazier said, later adding: "Matt made some big-time plays down the field, which resulted in a great day from a points standpoint. You’d like to see the quarterback stand in the pocket, be strong, be confident, poised and make those throws that he made. It makes our offense and our team so much better." Cassel had a quarterback rating above 80 each of the past three games — which includes a come-from-behind win against Chicago, a narrow last-minute loss at Baltimore and last week’s win — while throwing for an average of 297 yards with six combined touchdowns and two turnovers. His play has only added to the "what-if" scenarios that have followed Minnesota (4-9-1) this season. "You need stability at that position," Frazier said. "You need a guy playing well for you to be successful over the course of 16 weeks. So the fact that we’ve had to move people around at that position, I’m sure it’s had some type of effect on where we are now. There’s no question about it. We’re not denying it." 1. How different is it this week that it’s a more comfortable situation that you know you’re going to start for the last two games? Are you maybe not looking over your shoulder as much as previous starts, or how would you gauge it? CASSEL: I feel pretty much the same. If Coach gives me the nod, then I’m ready to go. Again, as I’ve told you guys all along, I think my approach, I try to stay as consistent as possible. It’s nice going into a week knowing that you’re the starter and there’s no questions being asked in the locker room. So, I think everybody’s prepared, like I said, to hopefully build off of what we did last week and go in there and have a good performance. 2. Do you think things would be different for this team if in training camp you had gotten a chance to be the starter? CASSEL: I honestly can’t say that. One of our big duties as a player is not to dwell on the past and stay in the now because that’s the only way you’re going to continue to move forward and be successful. 3. Forty-eight points (last week) without (Adrian) Peterson, did you see some of that potential in this offense when you signed here? CASSEL: There’s no doubt. I think you look across the board for us offensively, we’ve got a lot of weapons on the outside. We’ve got some good tight ends. Our offensive line is a veteran offensive line that has played together for a few years, and then you’ve got your great running-back situation here. So, when I signed here, there’s no doubt that came into play. 4. You, of course, have a contract option for next year. Would you say you’re giving more consideration now to coming back than maybe you would have a couple weeks ago when you weren’t seeing the field? CASSEL: I’ve had that question a lot and the fact of the matter is I don’t really think about that, because I think it would be unfair to the guys in that locker room, unfair to myself, unfair to our fans. Because really we’ve got two games to go and when you start worrying about and thinking about that stuff, I think it distracts you. For me, there’s going to be a time and a place for me to sit down with my wife, my family and discuss all that stuff. But right now is not that time. I’m really excited about having another opportunity to play for the Minnesota Vikings and be the starter this week and go out and play. 5. You were under a lot of pressure from the fans (in Kansas City). It was well-chronicled some of them cheered when you were down on the ground last year hurt, but you never really lashed out. Is that not in your nature or was that difficult when the fans were cheering in that situation and not to say anything and keep it out of the public eye. CASSEL: I think we’re all human. You hear that stuff and do all that. â¦ Everybody’s going to have an opinion, whether good or bad, and if you get caught up in that and you don’t truly believe in yourself and what your capabilities are and what you can do, then I think it’s a downward spiral from there. So, I think you surround yourself with people that support you, you surround yourself with your teammates who care about you and you continue to move forward and just try to take out the positive and believe in yourself."